I like to cook. And I like to invent my own recipes. And I like to try other people’s recipes. And now I’m going to share them with you. 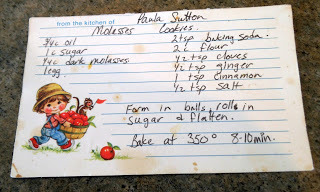 I remember these recipe cards! In a large bowl, lightly beat the egg, then add oil, sugar and molasses and stir until mostly blended. Add the dry ingredients and mix thoroughly. 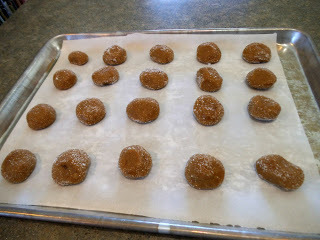 Form into balls – about the size of an English walnut – and roll in sugar. Put them on a cookie sheet. I line mine with parchment paper. Ignore that “ball” on the lower right. I don’t know what happened! Flatten each ball slightly with the back of a spoon. Bake the cookies at 375° for 8-12 minutes. At my higher altitude, I need to bake them closer to 14 minutes. The key thing is that you don’t want to over bake them – you don’t want them hard and crispy. But you don’t want to under bake them, either! 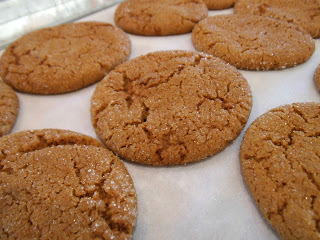 When they are baked just right, they are crispy on the outside, chewy on the inside, and oh! so delicious! NOTE: All recipes must be original or used with permission. This recipe was originally Caramel Pear Tart, but as much as I like pears, I like apples better. Whisk flour and salt together in large bowl. Add milk a tablespoon at a time until mixture forms a ball. 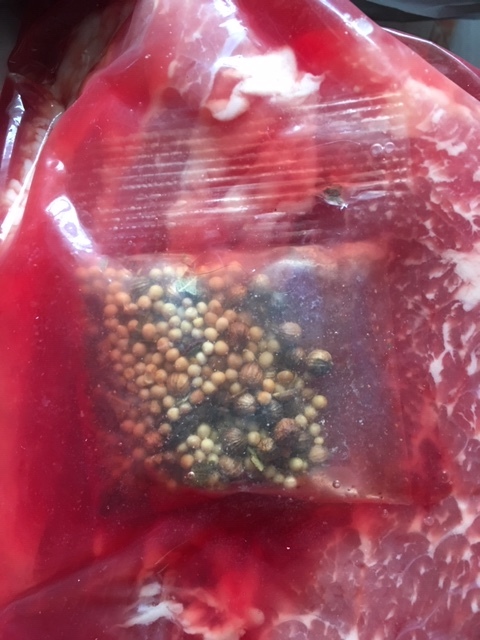 Seal in air-tight container, or wrap in plastic, and refrigerate for 2 hours. 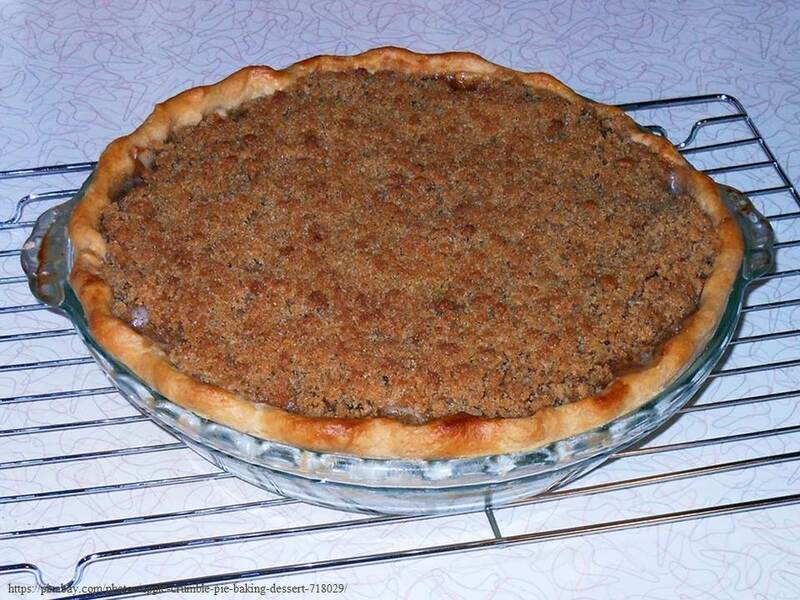 Sprinkle flour onto pastry sheet or counter. Place dough on pastry sheet, and dust with more flour. Roll dough to fit pie plate or baking dish. Place dough in baking dish and press evenly into bottom and sides. Arrange slices evenly in the baking dish. Sprinkle caramel pieces over apples. 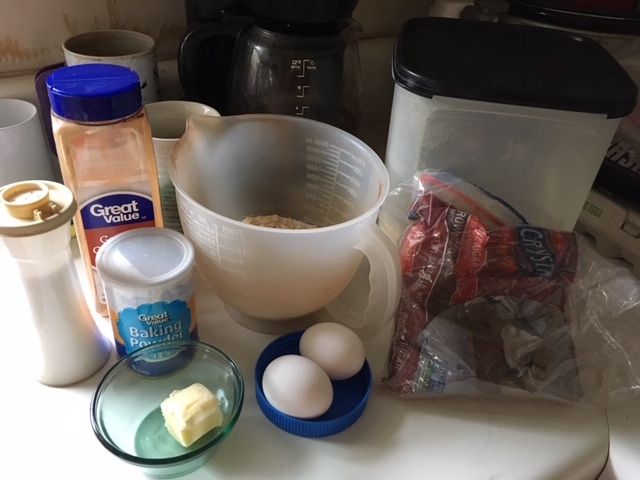 Add cinnamon, flour, and oats. Sprinkle over apples and caramel. Place in oven and bake for 20 – 30 minutes. Use pears in place of apples. Use peaches, and omit caramel pieces. Add ½ cup chopped pecans or walnuts. Originally found in a high altitude cookbook, I have adapted this recipe over the years. 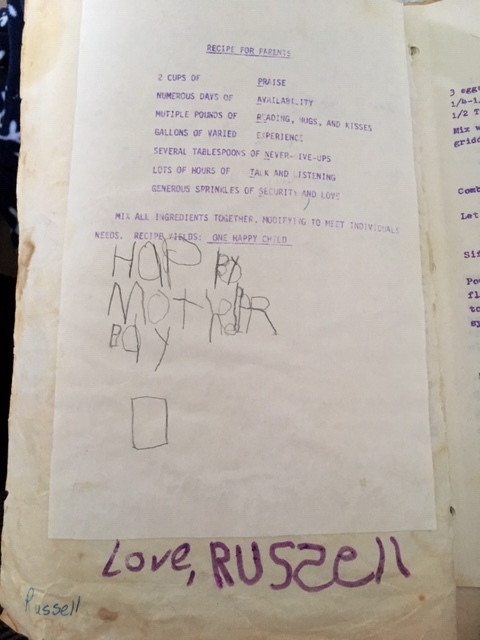 It was a favorite Saturday morning breakfast when my kids were growing up, and Manchild #2 even used this recipe to contribute to a Mother’s Day Book of Favorite Recipes his kindergarten class made. * I make a half recipe to make 2 pancakes for myself, and store remaining batter in the fridge. 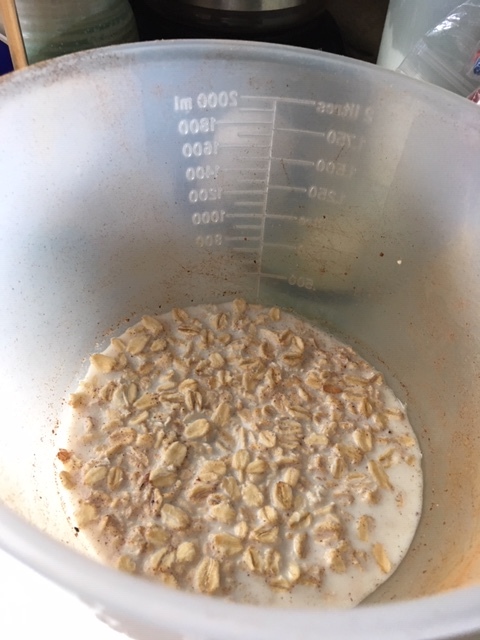 Combine milk and oats. Let stand—original recipe says five minutes, but I like to let it sit longer, and do this step the night before and let it sit in the fridge overnight. Combine dry ingredients and add to liquid mixture. Scoop batter onto hot griddle. I use a third cup measure. Turn when top of cake begins to bubble. Pancake is done when second side is golden brown. 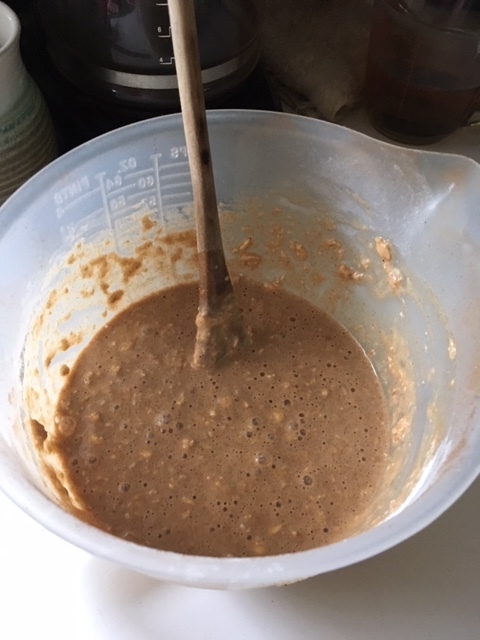 Stir the dry cake mix and pudding mix together. 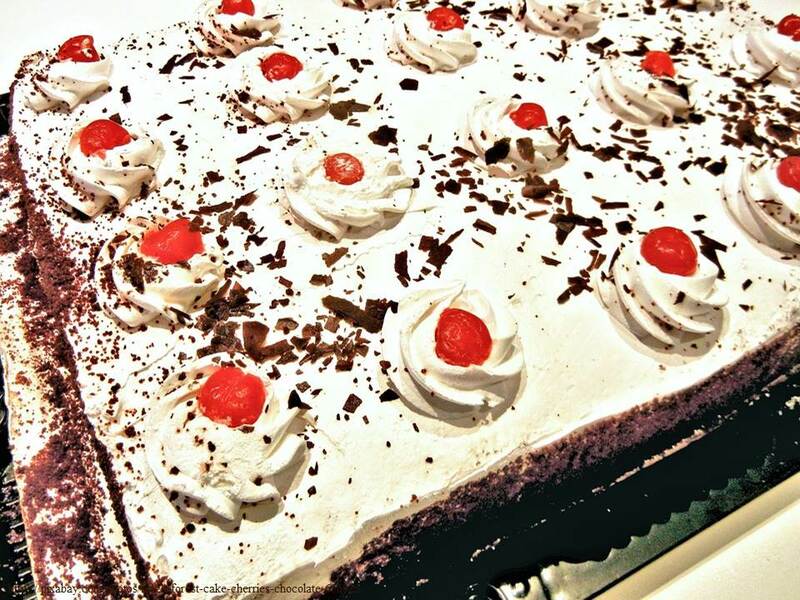 Top with whipped cream and maraschino cherries. 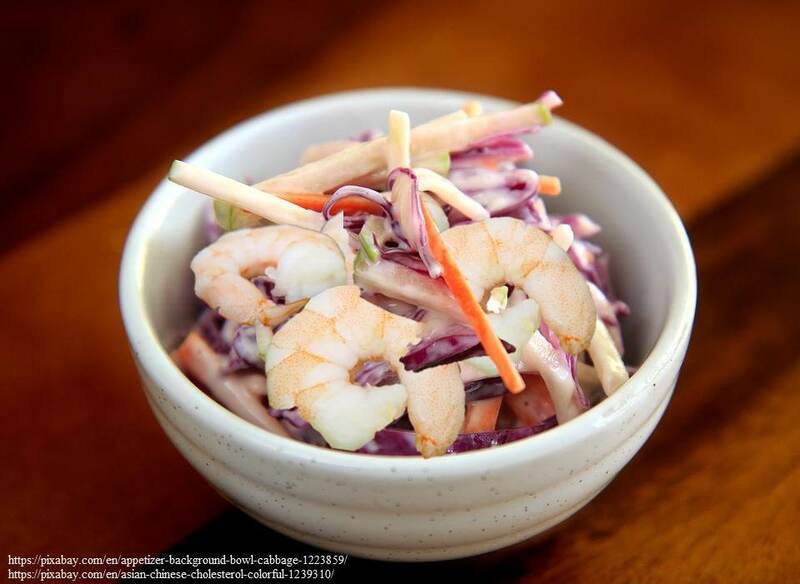 Combine cole slaw mix, shrimp, carrots, and onion in a medium sized bowl. Mix all the ingredients for the dressing together in a small bowl. Pour over shrimp and veggies. Serve with rice or Chinese noodles. I’ve heard this isn’t truly an authentic Irish dish, but it’s one of my favorites. Remove roast from packaging, and place in crock put with spice packet and brine juices; turn on to high setting. Cut cabbage in half and remove stem; quarter each half; add to roast. Clean and cut potatoes into bite sized chunks, and add to roast. Add water to cover roast and vegetables. Cook on high heat for an hour, then reduce to medium heat for 2 – 4 hours, or as per directions on package. Cook time will vary depending on size of roast. 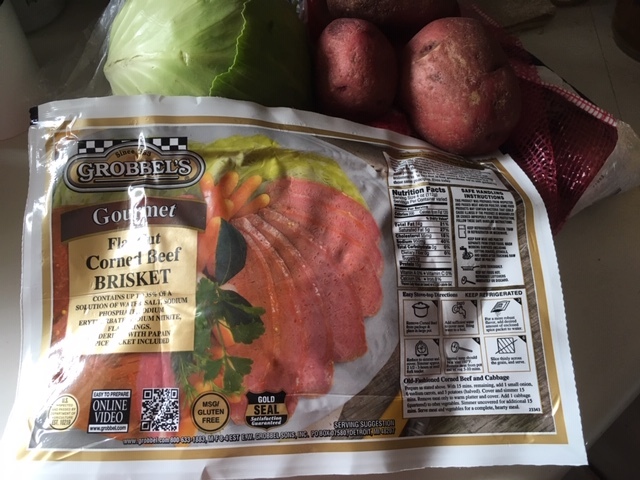 As with most anything I cook in the crock pot, I start it early—sometimes prepping the night before—and cook it on low all day long. 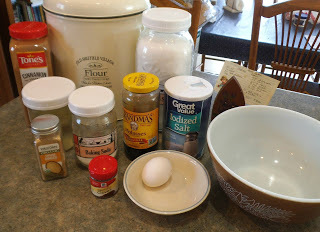 Mix together 4 cups of flour, sugar, salt, and baking soda into a large mixing bowl. Cut butter into the flour mixture until it resembles coarse meal. Make a well in the center of the flour mixture and add beaten egg and buttermilk. 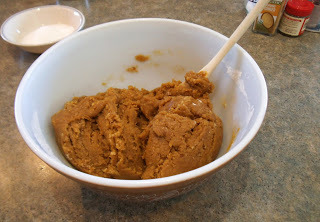 Mix in with a wooden spoon until dough is too stiff to stir. Dust pastry sheet and hands with a little flour. Turn dough onto pastry sheet and gently knead to form a ball. *Add small amount of reserved flour as needed till dough is not sticky. Do not over knead. Lightly grease a cast iron skillet and place dough in skillet. Using a serrated knife, score a crisscross into the dough about a half inch deep. 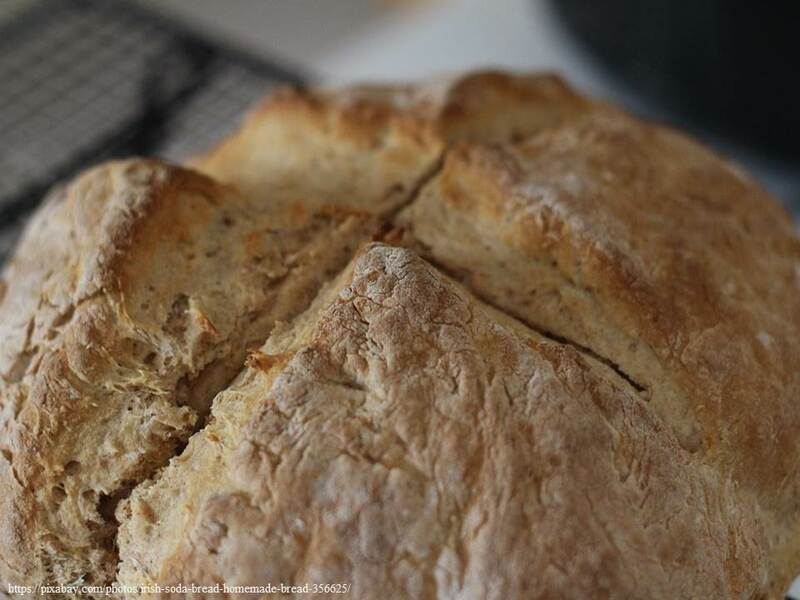 Place pan in oven for 30 – 40 minutes, or until bread is golden and bottom sounds hollow when tapped. Insert skewer or toothpick to test for doneness. Drizzle top with melted butter or glaze. Add 1 cup currants or raisins, or other berries. 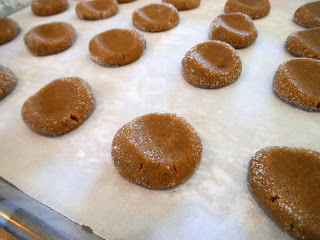 Add ¼ teaspoon cinnamon and increase sugar to 2 tablespoons; add 1 diced apple. Add ½ teaspoon cocoa powder and increase sugar to 2 tablespoons. Drizzle with chocolate syrup when done. Bring chicken broth and 1 can of water to a boil. Season with salt and pepper, and place chicken in the broth. Cover and simmer until tender. I leave it to cook for 2 – 4 hours, not unlike crock pot cooking. Pull chicken with two forks till shredded. Mix Rotel with reduced broth. 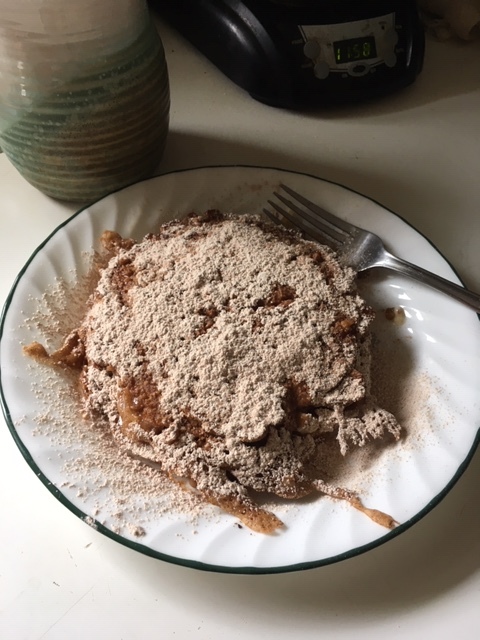 Heat tortillas in microwave for 15 seconds. 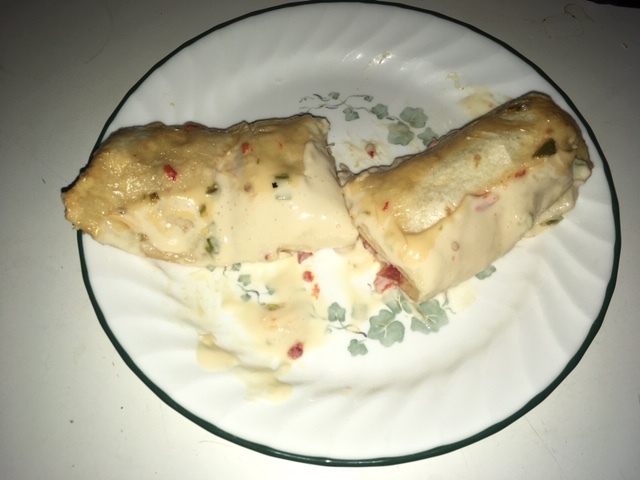 Divide chicken and Rotel mixture into eight sections. Scoop chicken and Rotel onto individual tortillas. 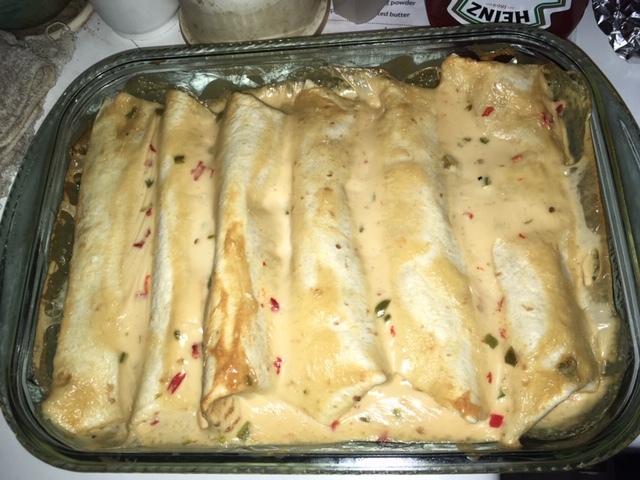 Roll the tortillas and place in baking dish. Sprinkle grated cheese over top. Use pico de gallo in place of Rotel. Use hamburger or shredded beef rather chicken. Sprinkle cut black olives on top. Sprinkle cut jalapeño peppers on top. Top with diced tomatoes and shredded lettuce.